Being certified as a project management professional (PMP) is advantageous for many reasons. First, it can separate you from the rest of the competition. Second, once you have completed your certification you then join a network full of resources and contacts. Third, the certification gives a right of passage to new opportunities and distinction. Fourth, this certification is the icing on the cake. Cake tastes delicious without icing, but when you add the icing, the two together make for a more fulfilling experience. Same is true with a PMP certification. The educational experience will serve you well, this accredited education will “round you out”. Anyone can say they are a subject matter expert, but without recognition from a trusted institution that title, often self-designated, does not hold much weight. Yes, there are exceptions. But given all this, it is therefore an excellent idea that you pursue a project management certification such as PMP or CAPM. And even after you have completed this certification, which is no small feat, there’s still opportunity for professional development. Also, you must stay current regarding industry in order to keep your Project Management Professional status. Every project, regardless of size, has some sort of economic and social impact. There are stakeholder costs, like, money, time and resources. Thus, it’s critical that a project manager successfully deliver a quality product on time and within budget. This is not always easy. However, it becomes easier with the right education and experience. This is where PMP training institutions come in. Their goal is to help aspiring project managers learn and utilize skills like, problem-solving skills, soft skills, as well, have a learning experience where knowledge is produced between classmates and instructor. After certification, PM training sites offer continuing education courses for professional development units needed for certification renewal. It’s also a way to stay up to date. So, where should you study to get your PM certification? There are a lot of institutions who offer this training, through online media, intensive boot camps and many other means. Here are our 5 picks. If you want to pass the PMP exam the first time, the way to go about it is: practice, practice, practice. PMaspire provides a number of PMP preparation tools to make your preparation and studying a breeze. They have thousands of test questions based on the the PMP exam format, with complete PMP exam simulations. You are able to see how well prepared you are, and which knowledge areas may need revision. You can create mini-tests based on those knowledge areas that you need more help on. In addition, it includes a quick study guide and flash cards to keep your progression in check. We recommend signing up for their free version (which includes 400 questions) to try out. PMaspire provides indispensable tools that are complimentary to any other preparation, boot camp, or classes you are enrolled, in your quest for PMP certification. The Junior Project Manager is an online platform from Berlin-based Blendlee Learning Technologies UG. It offers an online course delivered in a unique way: through storytelling and blended media. A fictional junior project manager tells his story to his audience/students about his day-to-day life, imparting important project management concepts along the way. The introductory course covers basic project management principles, methods and tools. Furthermore, by listening to the animated story, students are shown clear connections and contextual learning of real-world project management in action. The $29.99 online course is ideal for beginners, PM students, self learners as well as trainers and professionals studying for the PMP. PMstudy provides PMP training, certification and exam prep. They proudly announce that they have a 98.7% success rate also understood as a completion rate. The other 1.3% opted for a course refund. This school provides PMP training via a 4-day classroom boot camp and online training. Online courses include PMP certification courses, CAPM courses, and continuing education courses. Methodology includes videos, simulated examinations, hundreds of chapter test questions, study guides, podcasts and mobile apps. Their course plans start at $25. Project Management Academy is a PMI registered education provider that started in 2009 and is proud to have a PMP exam pass rate of 99.1% since 2010. Aside from PMP training, they also offer continuing education courses/PDUs, PMI Agile Certified Practitioner certification training. They also have a unique curriculum for senior project managers called Master’s Certificate in Advanced Project Management. The school supports their students by offering post-class tutoring and in-house group training. Simplilearn is an online global provider of classroom training for professional certification courses. It has several PM training courses which include PMP, CAPM, MSP, PMI-PgMP, PRINCE2, PMI-RMP, and others. For PMP training, courses are conducted in the US, Canada, UK, Saudi Arabia, UAE, India and Australia. For the PMP course, registrants can opt for classroom boot camp training, online courses, live virtual classrooms or simply take up to five 200-question PMP exam practice tests. The career path of a project manager is likely to, at some point, lead to PMP certification. Of course, there are arguments that it is not the ‘end-all be-all’ to have a successful PM career, though it definitely helps. At some point, if you decide to get your certification you will need to come up with the best strategy to prepare for it. These 5 PM training sites are but a few good options to look at. Whichever choice you make, you will find yourself amongst other professionals with similar goals. As well as those who have already completed the goal of certification and are ready to offer some friendly advice, help you study, or simply be encouraging. Still not convinced that a PMP certification is for you? Watch this short compelling video that will explain what a PMP certification can do for your PM career. Very well explained. I would like to add one more training site for project management or PMP exam preparation “Trainings24x7” from which i got training program. Recently, i have become PMP Certified. I would like to recommend to visit this website http://trainings24x7.com/ for pmp exam preparation source. Best of luck for pmp exam! Hey , You are going good. I would like to share one more site for PMP. You can check http://goo.gl/UeHHPd . It provide 24/7 online training . So you can must utilize these benefits . Please add this in your collection http://goo.gl/UeHHPd . Not sure how frequently you update your provider listm but whenever you do next please do look at our site http://www.izenbridge.com , we provide very effective online PMP program to professionals. If you want to learn project management but you do not care so much about these certifications check out: http://www.projectmanagement-training.net. You can get a free open source project managers manual there as well as training courses (paid). I enrolled in Master of Project Academy and here are my thoughts. Here is the honest feedback of the course. I signed up because I would like to get into project management but don’t want to have to pay to get a second masters before I can work and make close to what I already make. After looking at courses this blog highly recommended this company. I like the payment option. Pay per month means if you are diligent you can get the class for around $15 depending on the course. I signed up for Agile Scrum. The website is super easy to navigate as well. What seems fishy to me. Every single video lecture, which is basically someone narrating a power point presentation in a very dry way, has an extra minute of dead video space on it. So the total length of the videos offered in the course is much lower than they tell you. Two videos have 9 full minutes of dead space each! So for there has been 36 minutes of video dead space an I am only 52% complete with the course. Also, there is nothing interactive at all about these courses. There is a discussion board area below the video but so far not a single person has ever posted on the board. I don’t even know who the instructor for the actual course is. When I click on instructor it just says project management academy. I haven’t finished the course yet but I am not sure how this is supposed to set you up for the exam any more than Agile Scrum for dummies would. Nice! Thanks for the actual feedback… very helpful! Nice post. I learned something. Many companies are now looking for PMP Certified Project Managers so this is a great time to get certified if you are a Project Manager. This list will be very helpful in deciding which training provider fits your needs the best to start training for the PMP Examination. I personally benefitted from just writing down the Knowledge area/ process group table a few times and understanding the connectivity of all the ITTOs flow via mindmapping. I was able to clear the exam with around 7 days of preparation. The questions during exam were very lengthy and answers definitely were more application of knowledge . So understanding the connectivity between ITTO processes helped me a lot. I attempted the Lehman free questions 75 and got around 68% the night before exam. Although i personally wasn’t able to use the “ITTO tool” created by jack ferguson (http://itto.sixsigmascrumlive.com/), i did browse it to see if it might be useful. I recommend it to memorize and understand the connectivity of ITTOs for the PMP exam. My only tip: Read to understand the connectivity between all knowledge areas 🙂 rather than memorization. Yes PMI accepts their program! Rahul Passed the PMP exam in 30 days with their program. 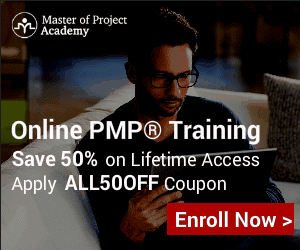 Also, if you enroll in their FREE PMP training: https://masterofproject.com/p/pmp-how-to-apply-for-pmp you will see that after an application is filled in with PMP training details of Master of Project Academy, PMI approves the applicants form to sit for PMP exam! Would anyone recommend PMTraining online virtual classes for $894. They guarantee you will pass the exam. No. Their course and exams do not prepare for the new type of questions on the PMP exam, which I failed three times. I do not recommend PMTraining. I would like to included http://www.quizpm.com. a simulador i use todo prepare the exam un spanish. http://www.velociteach.com/ would love to be reviewed for future posts or updates! As a project management training company, Velociteach’s roots are PMP exam prep, beginning when our CEO Andy Crowe wrote the textbook The PMP Exam: How to Pass on Your First Try. We were also awarded as PMI’s Provider of the Year in Continuing Education. With the PMP exam change coming up in Q1 of 2018 lots of providers will be updating their materials and resources. Please consider checking Velociteach out as we have some awesome things planned for the 6th edition! I totally agree these are top 5 project management training sites but I think you should add Koenig Solutions training site in your list because it is providing world’s best classroom, excellent environment, practical labs, online training, well-trained instructor, learning atmosphere with best facilities, learn the latest technology with updated tools. I think you missed https://www.4PMTI.com. They have been around 15 years providing PMP certification training classes globally. I took their course in Washington DC. It was phenomenal. Can anyone recommend ExpertRating? They offer PMP training as well? I used the Velociteach program while studying for my PMP exam in Nov 17. I passed the exam on the first try. During the exam I felt I was very well prepared. I was prepared for the length of the exam, had plenty of time to finish the exam, go back and review the questions, and even complete the exam before the 4 hrs were up. Passed with well above required target score. I highly recommend http://www.velociteach.com/ to anyone preparing for the PMP exam. You will be glad you did.